4 chambres, 2 salles de bains, douche extérieure, 8 couchages. Nouveau A / C système 4/15. Profitez de la belle vue et une 200 verges à pied de la plage de la Société confort d'une maison sur la plage 4 chambres, 2 salles de bain, avec une terrasse sur le toit et une douche extérieure. Marche avant et en arrière de la plage à votre guise. Facile d'accès au village de Dennis pour le shopping, sport et gastronomie, antiquités, galeries d'art, des concerts sur le vert, et le Cap Playhouse et Cinéma. À proximité golf, tennis, VTT, pêche, voile et la randonnée. Eau douce Scargo Lac avec historique Tour Scargo, Sesuit de port sont à proximité. Great house! So close to the beach. Wonderful Dennis home with beautiful water views and close proximity to the beach. 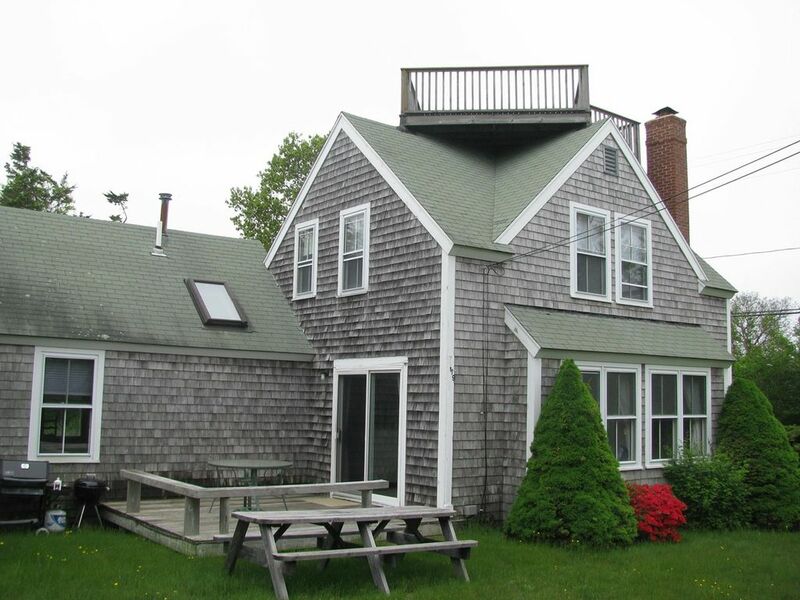 We had a fabulous week in Dennis and this home perfectly suited our group. It was very comfortable and felt like home for the week. The view of the beach and water from the roof deck were spectacular and we couldn't have hoped for a closer proximity to the beach. It made getting to the beach with four kids in tow very easy!! We hope to return next summer for another memorable vacation! Great location! Cute house! Great for families! My family had a great stay this summer on Seaside Ave! It was so close to the beach, we went several times each day! Corporation Beach is very pretty. Nice for families. No loud teenagers and music. Never over crowded. Lots of fun at low tide! The house was clean and very spacious for all of us. We had a great stay. Loved the use of beach chairs and yard games! Outdoor shower was nice too. The only reason for 4 stars instead of 5 was I think for the weekly rate, there could be a few updates done to the house - new screen doors, better patio furniture, linens available, new couch in living room. Would definitely rent again! We were close to other beaches and towns for shopping and sightseeing! The location is what sold us. We liked the ease of the short walk to Corporation Beach and its amenities like the Surfside Grill. It is a short car ride to get into town to the shops, restaurants, and theatre. My husband even walked to meet us at the theatre after the Friday morning children's show. This part of Dennis is so centrally located near so many activities for both the adults and the kids (plays/shows, beach, canoeing, fishing, movie theatre, restaurants, museums, etc.). Not all houses on the cape have AC, so it was nice to have this option even though the evenings are often cool. Lauren, thank you for your review. It was a pleasure hosting you. We're pleased that you enjoyed your stay. Environ 200 yards de Corporation Beach sur la baie de Cape Cod, vous pouvez aller et venir de la plage quand vous le souhaitez. Vous pouvez regarder le coucher de soleil sur l'océan de la plage ou de la terrasse sur le toit. Facile d'accès à Dennis Village avec des concerts de la bande d'été, le Cap Cod Playhouse et le Musée d'Art de Cape Cod et Théâtre marché. Grands restaurants, shopping, courts de tennis, terrains de golf, des sentiers pédestres, pistes cyclables, pêche, magasins d'antiquités et d'art font de cette l'endroit parfait pour vos vacances.